During the summer months it is possible to get a passenger ferry straight from John O’ Groats, this is often combined with a day tour bus trip on Orkney. At £64 per person (Summer 2017) this may well be worth it depending on the vehicle you are travelling in. 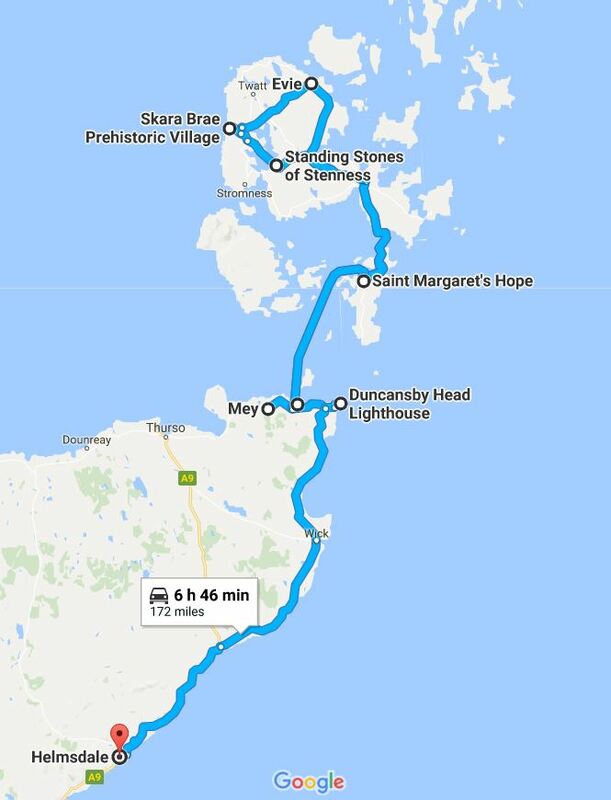 If you are set on visiting and driving yourself, the options catch the Scabaster-Stromness ferry or the Gills Bay-St. Margaret’s Hope. The latter is cheaper, and with a approximate sailing time of one hour is also a half hour quicker than the former option. We managed to get tickets simply by turning up on the day, but in high season advanced booking is required to guarantee a trip. We payed £16 per bike, plus £16 per person each way. Using a ferry on my motorbikes involves a little more than popping the handbrake on the car and leaving it in gear. We drove over a chain, which was then used to help strap our bikes down so they didn’t fall over during the crossing. The crossing wasn’t horrendously rough; or perhaps my experience of severe sea sickness in New Zealand has strengthened my stomach somewhat! There were enough rolling waves to send a number of car alarms of – often just out of sync, so we were serenaded for the majority of the crossing. As you make the crossing, you pass the islands of Storma and Swona. Swona is particularly interesting as it is inhabited by a herd of feral cattle. Abandoned when the final residents left in the 1970’s they now have free reign over the tiny island. Stroma is also deserted and itself is inhabited by sheep, however these are tended to by a former resident. You can see the cattle and sheep clearly from the ferry, and if you are lucky, there is a chance to spot whales, dolphins, puffins and a variety of other birds. We managed to spot a few gannets, and that was about it! The rough weather meant that there was a chance of an early recall for the return ferry home, so we spent the day checking our phones to ensure we hadn’t missed a call. By the time we landed in Orkney, found fuel and really got underway, it was around midday, which didn’t give us a great deal of exploring time, especially as we were expecting an early recall to the ferry due to the poor weather conditions. Luckily, this didn’t happen, giving us a solid four hours of exploration. Ian’s TomTom failed spectacularly at leading us to Skara Brae, having struggled to first recognise the correct “Skaill” as the nearest town. Luckily, Orkney is not all that big, and doesn’t have a great deal of roads, so we easily rerouted ourselves, and arrived miraculously unscathed; The wind along the way was so strong, we had to ride at an angle in order to continue in a straight line, and every building, hill or vehicle we past disrupted the wind flow. This combined with random gusts from unexpected directions resulted in a fair few forays around either side of the road! Both glad to relieve ourselves of our helmets for a while, we spent an hour or so delving into Skara Brae’s history. This Neolithic village was uncovered from beneath a sand dune in 1850 and provides vital evidence to early life in Britain. Astoundingly preserved, the cluster of eight stone houses is estimated to have been the home of city to a hundred people. Nearby, the stones of Steness and Brogdar, as well as intricately carved stones found within the settlement hint at a highly religious or ritualistic society. It’s hard to imagine the existence these people would have had, with the harsh Orkney weather. Yet, 5000 years ago, the cluster of houses would have been much further inland, undoubtedly more sheltered than it’s now shore front position. Inside the reconstructed model house. Each house was constructed to the same standards. Can you believe this was built 5000 years ago? Imagine lifting these into place! This quaint building was built by P.O.W.’s and utilises two Nissen huts. Wrecks by the causeway on Orkney. We made it back to the ferry terminal and made the hour’s journey back to the mainland before making the long journey down to Helmsdale. We took a short detour to Dunscanby Head, the most north easterly point on the mainland, and then headed straight down the A9. With the light fading we had to miss various other photo spots and arrived at our guest house a little past eight o’clock. Tired and hungry, we struggled to make contact with the owner, and cold and getting grumpy we decided to find something to eat first. On a whim, we tried the door and realised it had been left open for us; oops! Ian, was however, struggling from a severe hunger low, so we quickly headed out to the nearest pub! We ended up in the Bannockburn Inn and had one of the best (and most affordable) meals of our trip.